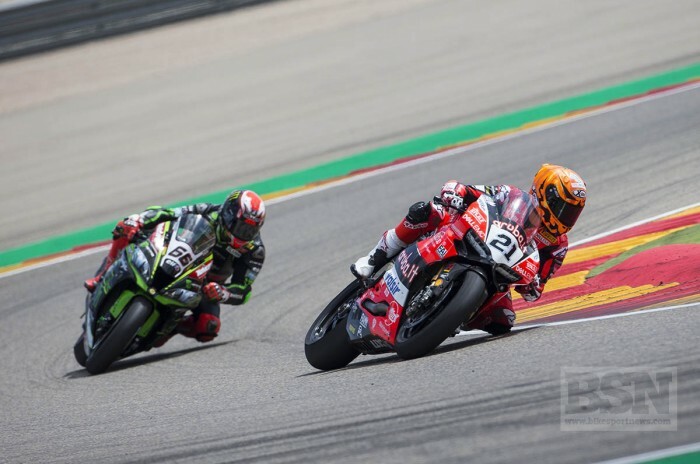 As if having factory riders Chaz Davies, Marco Melandri and hyper-competitive privateer Xavi Fores on their books was not enough, Ducati released a new mini-kraken into the WorldSBK scene ay the weekend, Michael Ruben Rinaldi. The diminutive 22-year-old Italian has already proven to be a top runner and champion in Superstock 1000 last season, and his reward is an Aruba.it Racing Ducati Panigale for the European races only – so far. He had his first run out with the Superbike big boys at Aragon, and was eighth in Superpole, eighth in race one, and seventh in race two. He was 19 seconds behind the race one winner on Saturday, but just 15 behind on Sunday, and with riders such as Ramos, Baz, Giugliano and Savadori behind him in the opener and even Torres one place back in race two. After Fores crashed out in race two Rinaldi was even in the Sunday paddock show as the top independent rider, with seven others of that status behind him in race two. A factory bike does not hurt for Rinaldi, although it is the same as Fores’ private one says everyone. But cynics may say that he is so at home inside the WorldSBK paddock straight away because his STK1000 Panigale electronics and engine were at neo-Superbike levels of performance anyway. Add in a few more special WorldSBK bits, and slicks, and his transition to WorldSBK should be relatively smooth. And, such is the narrowing gap over the last few years between Stock 1000 and WorldSBK, which will see Stock getting the heave-ho in 2019. Rinaldi appears to be another young Italian rider who can be the real deal, or not, but with direct support from Ducati and Aruba he should have all the tools. Whether he has the race intelligence and pure podium skill to make the most of it we will find out, but probably sooner rather than later. Another new name to conjure with that is maybe his best value right now, in a season that is bringing surprise and close racing every weekend so far. And remember, he is also a product of the CIV and WorldSBK classes, not an import from the bigger MotoGP series, or Spain, which also makes him something slightly unusual at the sharp end of some WorldSBK paddock classes nowadays.